The "Lenovo" is getting ready to launch an update to it's Miix-700-tablet. The new model has a higher-resolution display, that comes with a keyboard cover featuring back-lite keys, and it also has a "USB" Type-C port, from other changes. It also swaps out a Core M-Skylake chip for up to a Core i7 Kaby lake processor coverage. 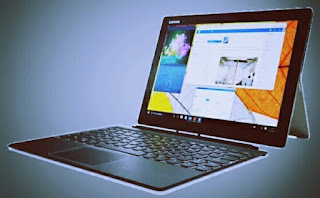 "Lenovo Miix" - 720 - has not officially been unveiled yet, as these a leaked review so there’s no word from Lenovo on how much it will cost or when it will be out for sale, but the "German" site WinFuture seems to have uncovered leaked details covering just about everything else you would want to know about the new tablet. display and it supports up to 16GB of DDR4 memory and it also supports up to 1TB of PCIe solid state storage. What the WinFuture, said => the Miix 720 will be available with Core i3-7100U, Core i5-7200U or Core i7-7500U processors, that's to say that this year’s model should be much more powerful and better than that of last year’s… but also it will be more expensive. Sometimes when the latest Microsoft Surface the Pro tablets are still using 6th-generation Intel Core (Skylake) chips, it’s so interesting to know that (Lenovo) is moving to 7th-generation --Kaby Lake-- processors. The lenovo's USB C port can also be used for charging the tablet’s 41Wh battery. The tablet along side measures about 0.35 inches thick and weighs about 1.7 pounds. Add the keyboard cover and you have gotten a device that’s about 0.57 inches thick and 2.4 pounds. It also uses the same watchband style hinge for the kick-stand in the back of the tablet that the company’s been using for its latest Miix devices. Some features include dual array microphones, stereo speakers a 5MP rear camera, and a 1MP front camera that support for Windows it will be out anytime from now.